It’s a book! It’s a poster! It’s a toy! Hours of enjoyment! 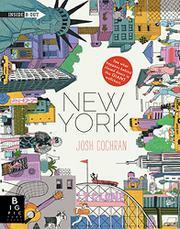 Cochran has made a large-format accordion-fold panorama of New York City—mostly Manhattan of course, but with nods to Brooklyn (bridge), Staten Island (ferry), Queens (Eddie’s Sweet Shop) and the Bronx (zoo). One side points out landmarks large and small: There’s the Statue of Liberty, the Chrysler Building and one of the New York Public Library’s lions, but also Katz’s deli, the Central Park carousel and Peking Duck House. The other side pictures the same busy, colorful, detailed scenes but with cutaways revealing the insides of buildings, objects and vehicles. The illustrator has populated his New York with zillions of small figures reminiscent of the online gallery “Humans of New York,” but there are also monkeys (climbing on the Guggenheim Museum’s spirals), robots, giant bunnies and even people in space suits (and a unicorn). Glimpses of the insides include folks doing yoga and karate, bathing children, working at desks and cooking (although it seems to be an octopus stirring the pot).